Being organized does not only help you find things more easily, but it also saves you from a lot of pain from merely seeing messy things around. Why don't we start getting organized with our things? With only the help of some plastic buckets, organizing can never get easier! Office or study stuff can easily be organized in square plastic containers. We have EZStor plastic pails with a wide range of size and shape selections. You can put small stationery like pencils, pens, rulers and erasers in smaller square pails such as ½ gallon, ¾ gallon or 1 gallon square pail. Letter papers can fit nicely in 3 gallon or 3.5 gallon square pail. Use 3.5 gallon square buckets with lids to store the bed sheets, pillow sheets, under garments, etc. and stack them up in the closet. Put labels on the outer side of the container for easy find. This will keep your closet tidy and your clothes and sheets will keep nicely clean inside closed buckets. You probably have more kids stuff in the nursery than kitchen utensils if you have children in the house. There seems to be more and more toys every time you get in there, doesn't it? Well, you don't have to see them lying around if you have 3.5 gallon square buckets in the kids room. You can put the toys and coloring pencils there and the room will be amazingly neat when the kids are not there. This is also a great way to start teaching our kids to be organized themselves. Engage them actively to clean up the room every time they finish playing. Ask them nicely to always return the toys to the containers or the shelves where they are normally kept. Using round 5 gallon buckets can also be a great idea. You can choose various colors that are attractive to kids' eyes as identification of what is inside. 3.5 gallon square pails are ideal for storing these types of things. It's not too small or too big. Measuring at 9 15/16" wide x 12" long x 11 5/16" tall, you can put things, big or small, inside. Since it's made of FDA-approved food grade plastic, you can even store foods inside. Try grains and other dry foods and protect them from dirt by closing its lid. 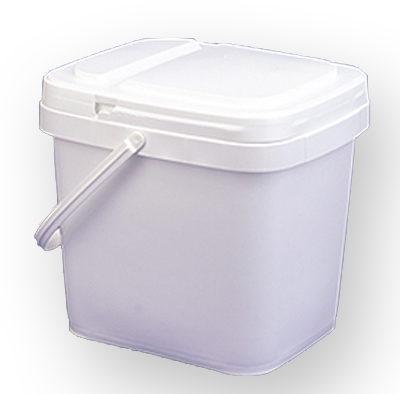 The 3.5 gallon square pails and lids come with a handle and are available to buy at minimum 6 packs. Check out the prices here or call our office at 888-460-3786.